The basic concept of Gran-U-Lizers is to shear (not crush) particles between two rolls. As the leading grinding equipment manufacturer, we have engineered grinders ideal for your application. Shearing is a non-attrition form of particle size reduction that is based on a low friction principle of operation. This low friction shearing results in minimal temperature elevation during grinding; and consequently energy and power requirements are minimized. Each roll is engineered for a specific application at a specific stage of size reduction. 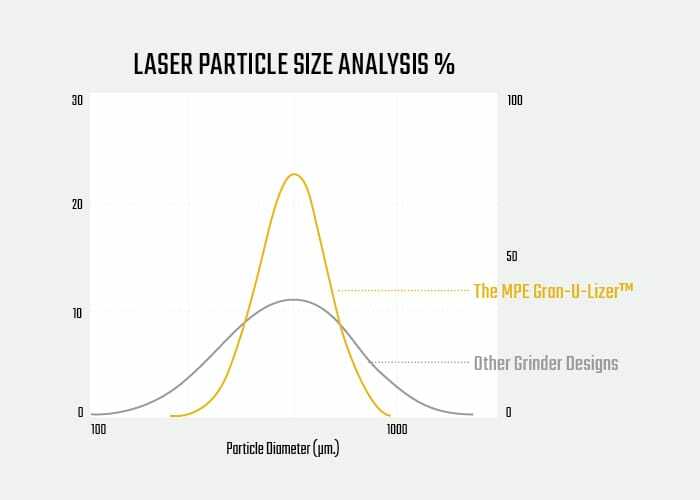 In totality, two Gran-U-Lizers of identical model can still be vastly different in their design due to the multitude of roll and mechanical optimizations that comes with 60 years of particle size reduction expertise and application testing. What's the difference between Gran-U-Lizers™ and other roller mills? MPE Gran-U-Lizers™ have corrugated rolls that accurately cut and sheer product down to specific particle sizes; anywhere between 4 to 325 mesh or 4,760 to 50 microns. Whereas traditional roller grinders crush product into less uniform sizes with more fines. Roll tooth size and shape, relative roll speed (such as a 1:1 ratio, 2:1 ratio, all the way up to a 4:1 ratio), and gap distance between rolls will largely determine the specs of your grinder. 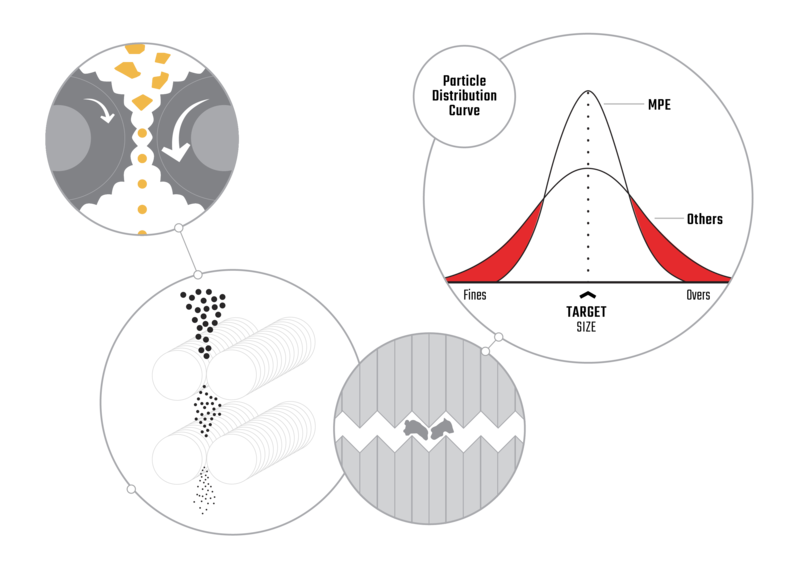 If your material is friable and the above factors are optimized for your product yields, the results are very tight particle distributions and minimal fines. 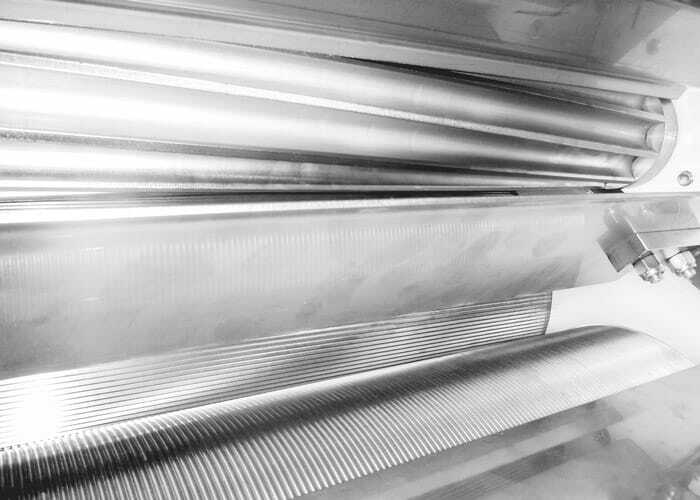 There are over 30 different roll corrugations for "F" and "K" rolls, with each being optimal for a specific particle size reduction applications. The Granulizer design is non-attrition (unlike hammermills, FitzMills®, attrition mills, etc. ), thereby minimizing the generation of fines in the grinding process. In thousands of installations MPE Granulizers have improved product yields, often by as much as 200-300% more than other grinding methods such as hammermills, FitzMills® and attrition mills.